Are Animal Rights Protesters Wrong to Interrupt Bernie Sanders Rallies? In one video of the event, protesters chant, “Animal liberation now!” and Sanders’ supporters boo them and chant back “Bernie! Bernie!” One supporter can be heard yelling, “Get outta here!” Another remarks, “Get a life!” In another video, people throw things at protesters holding up a sign explaining that “Animal Liberation is Social Justice.” When the sign is ripped away, the crowd cheers. Sanders responds by sarcastically remarking, “As I was saying…” In another video, protestors hold up a sign that reads, “Get Big Ag Out of Politics.” The response is the same–no noticeable support from the crowd, protesters removed by security, and Sanders ignores it. This group of protesters aims to disrupt people in public spaces to force the issue of animal rights onto the international agenda. This article isn’t about the effectiveness of such disruptions though. Objectively, I would need to poll the 250,000 people who watched one of the videos of the interruption and everyone who attended the event and read press coverage of it to determine if it swayed them positively, negatively, or not at all towards animal rights. Love them or hate them, such disruptions have been part and parcel of American democracy for more than 200 years from The Boston Tea Party to Occupy Wall Street and Code Pink’s protests during congressional hearings. I started working on Capitol Hill for an environmental lobby group the same year Bernie Sanders arrived at The House of Representatives in 1991. He was aware of the scourge of animal agriculture then–the historic March for Animals happened just six months earlier in D.C. As a member of the U.S. Congress for 25 years, he continues to be fully informed on the issue today. As I’ve detailed here, Senator Sanders is no friend to farmed animals. In fact, he proudly displays on his website his passionate support for the dairy industry and votes in favor of subsidizing farms that slaughter animals with taxpayers’ money. Sanders uses deceptive words like “family farms” to dupe less discerning voters who don’t realize factory farms with 100,000 animals crammed in cages are also called “family farms” by politicians. More than 99% of animals raised for meat in the U.S. come from factory farms. Sadly, despite his abysmal record on farmed animals, he remains the lowest hanging fruit on the compassion tree of the three remaining candidates. Thus, if people want to protest the denial of animal rights, it makes sense to hold such protests in an arena with people most inclined to listen–candidate included. Apparently, not so much given the reactions in the aforementioned videos. Thus, the reaction to the protesters by Bernie Sanders and his supporters warrants discussion. Let’s begin with Sanders. How could Sanders show that he really is a man of the people and not just another Washington politician? He could listen and respond. By now, he knows the protesters’ agenda. Imagine the good will it would build and how impressive it would be if he said, “Please don’t boo these people. While you may disagree with their approach, they are doing what I did during the Civil Rights Movement. They’re taking a stand for something greater than their own self-interest. That is not a crime. I hear them. I will do what I can to advance the cause of animal advocacy, especially in animal agriculture. Let’s applaud people for standing up for their beliefs.” Imagine. Instead, Sanders replied by saying, “We don’t get intimidated easily.” If he took the time to listen, he would quickly learn nobody is trying to intimidate him. These protestors are trying to force the issue of animal rights into the news as they do here. But as you can see here, Sanders is shockingly dismissive and disinterested in his response to the protests complaining that they detract from the real issues that matter. You heard right–Bernie Sanders said animal rights do not matter. Now let’s talk about the people in the crowd. They jeer, chant over the protesters instead of showing interest, throw things, and yell at the demonstrators. Looks like a Trump rally. What kind of liberal progressives act in this manner when people are explicitly expressing concern over a “social justice” issue? They literally labeled the sign “social justice” issue. Their lack of interest does not speak well for them, their “revolution,” or their torch-bearer. For a group of people who wave the tolerance flag, they would be well-served to follow their own advice. Agree or disagree with the protesters’ approach, the reaction speaks volumes about Sanders and his supporters. Why are these people so angry that their fellow citizens are exercising their free speech to advocate for an issue greater than their own self-interest? If such protests so offend the sensibilities of Sanders’ supporters, perhaps they should disavow their own candidate who Chicago police arrested for protesting, charged with resisting arrest, and found guilty. In these particular protests at political rallies, should animal advocates support Sanders with his dismal record on farmed animals, the degree to which it conflicts with the heart of his message, and his close-minded reaction to the protesters? Or should animal advocates support the animal rights protesters speaking on behalf of farmed animals even if they may prefer a more subtle approach? 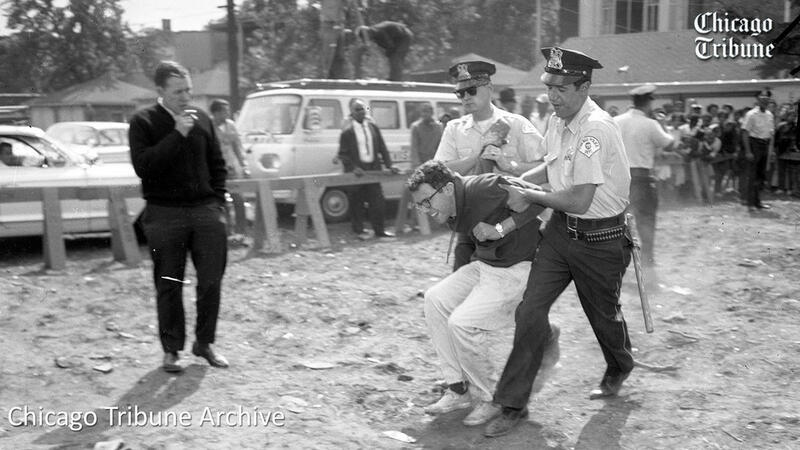 Given that choice, I’m with the Bernie from the 1960’s on behalf of civil rights and the animal rights protesters today because I don’t see a notable difference other than the animal rights protesters don’t resist arrest. No doubt. The best way to get politicians to get involved in worthy causes is by Protests. Media report is extremely important. Politicians are politicians. They will agree with you to get votes, but at the end of the day- they ignore you. Thanks for another very thoughtful piece, Andrew. I agree with your assessment and have vocally supported these activists for the same reasons you state here. Keep up the good work! Thank you Lori. I appreciate everything you do for animals. You’re such a dedicated advocate. though I voted for Sanders in the Primary; I now have second thoughts. Obviously he fears the loss of “big Agricultural Business” support. So, who supports big business now??? It seems that he does. While running most candidates (except the trump) want to try and please everyone. But how ethical is that? He is not perfect. I wish Clinton was. But at this time she will get my vote. Pivoting to Clinton because Sanders has a blind spot that she probably shares, in addition to all her other blind spots, doesn’t really make a lot of sense. Sanders was probably targeted by this action because he is the best candidate to eventually come around on animal rights issues, ironic as this may seem. Yes, he will not routinely be deterred from delivering the message he has already set out to deliver, but if there is a potential mainstream candidate to at least eventually figure out the importance of animal rights, he’s the one. Of the viable candidates, Sanders is the most prone to listen given his other positions. 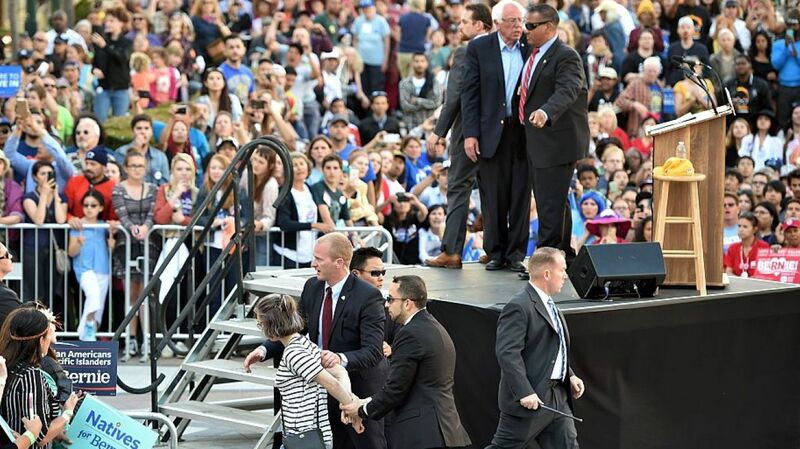 It’s interesting that some people have commented that the protesters should not “attack” Sanders. I don’t see holding up signs in support of animals and advocating for a cause as an attack. In the three videos I watched, I didn’t see any of them specifically attacking Sanders for his terrible voting record against farmed animals. He even voted for the AETA. We don’t ever have to give people a pass when they vote for cruelty over compassion. $hillary has a worse track record on animal issues in general than Bernie and has personally profited from animal ag. As a society, we would be well-served to think critically about our own positions and even challenge people we generally support on issues where we may differ. Bernie Sanders is a politician–not the Messiah. He has been a good advocate for many neglected causes for a long time but animal rights is not one of them. It is a worthwhile venture to ask him to add farmed animals to his list and to reveal the hypocrisy of his diehard support for animal agriculture. He is caving into and catering to his corporate constituency in Vermont–something he prides himself on not doing. None of the canidates are particularly good when it comes to animal agriculture, just like the vast majority of people in general. I agree that it makes more sense for Sanders to not be condescending towards the protesters and I am 100% behind them. Unfortunately, most people who work for social justice don’t include animals as something they work for. I still support Sanders over the other candidates since I agree with him more than the other candidates. Very true C.J. He missed an opportunity to recognize the legitimacy of the issue. Very unimpressive. As someone who was there for the Oakland rally when Sanders responded “we won’t be intimidated easily”, it wasn’t clear what the barricade rushing and shouting was about. Most people thought they were HRC supporters telling him to drop out. I don’t fault him for that comment when the message from the disrupters was unclear to everyone. Given that these protesters have been present at several of his events and hold signs about animals, I find that excuse hard to believe. Regardless, your reply ignores a significant body of other issues I’ve presented that do not reflect well on Sanders or his followers. Three words why every AR activist should support Sanders: Campaign Finance Reform. HC won’t do anything to dismantle the money-polluted political system bec she’s fully entrenched in it, and has benefitted immensely from it. Only Sanders will address the money in politics He is a vehicle to better candidates. AR needs to look at the bigger picture and have a long term plan. There is no candidate we want right now but getting money out of the political system will open things up to better candidates. Only Sanders will do this. And, there are perks that indirectly, but not insignificantly, affect animals: Sanders takes global warming seriously (and, will take on corporate influence in government decision making that impedes progress on climate change). He also opposes fracking. Habitat loss is the leading killer of animals (1-2 species of plants and/or animal go extinct everyday). Sanders also takes war seriously. Wars cause environmental destruction, and kill people and animals. AR needs to think strategically and long term. Sanders is the pragmatic, not emotional, choice for AR. Disrupting his campaign as it fights Shillary makes emotional sense. It is extremely frustrating to find people who are so progressive on human issues but can’t get past the mythic dividing line where animals are somehow different and less. Emotions are lacking in politics. I’m not arguing against emotional decisions. But, that’s not the arena we’re in. We need to calculate longterm goals. Sanders serves these better. I am very annoyed at this crap. Sanders isn’t going to win, we know that. Now leave him alone, and move on! I am very disappointed in Direct Action. Okay, you’re on the map, but you are losing your soul. I agree with your statement RKT. I don’t see any violence in these protests. The protesters don’t have weapons. They’re not making threats. They’re holding signs and making noise. I saw two people cross the barrier gate. Obviously this extra step will either get them arrested or asked to leave. Such actions are fairly common at political events throughout our history in protest of wars, civil rights, etc. I’m guessing those who do that do it to make sure it gets in the news whereas simply holding up a sign may not. I’m sure they would prefer not to get hit with a club for climbing over a barricade. Again, such protests at political events have been going on for hundreds of years in the United States. I’m not sure why anyone would be surprised by it. Sanders will continue to have power to shape decisions in the party, especially as a member of Congress. I don’t think we should ever leave someone alone who is such a passionate and powerful supporter of animal agriculture. I fail to see how people would be losing their soul by advocating for a cause that matters to them. It’s fair to criticize the approach if you disagree with it but I think it’s oddly inaccurate to say that people who protest on behalf of animals are losing their soul. I am one of the activists who disrupted the rally on Monday. Thank you for your thoughtful and painfully accurate piece. Thank you for caring Amy. I appreciate your passion and advocacy for animals. Having participated in many protests for animals over the past 25 years, I’ve always believed that when onlookers see people passionately standing up for a cause, it has the potential to jar their conscience and inspire them to think critically about their own decisions. I see the same potential in these political protests. Andrew Kirschner. You have officially lost your mind. Dxe is a group of crazies that only makes all vegans look like lunatics. They’rethe greatest enemiesof animals, as far as I’m concerned. This article and the stance I take in it isn’t about any other actions other than the protests at the Bernie Sanders events. I look at every protest through an objective lens. As I view this series, I don’t see the protesters being viewed as “crazies” or making “vegans look like lunatics.” I see activism on social media that concerns me much more. I asked a few people who eat animals what they thought of the protests because I was curious to hear others’ perception and they said they were surprised by how the so-called “progressive” crowd was acting instead of showing respect and interest. This is one of many steps people take in support of animals. A political protest won’t stop all the other good work being done on behalf of animals by plant-based food companies, sanctuaries, humane education organizations, and many others. The “greatest enemies of animals” are factory farms killing billions of animals. But, dissenting opinions welcome. Thank you for sharing your concern. The Bernie supporters I know seem to excuse his ignoring of animal agriculture, among other animal issues, on grounds that he’s just not up to speed, so I found particularly interesting this remark of yours…”I started working on Capitol Hill for an environmental lobby group the same year Bernie Sanders arrived at The House of Representatives in 1991. He was aware of the scourge of animal agriculture then–the historic March for Animals happened just six months earlier in D.C. As a member of the U.S. Congress for 25 years, he continues to be fully informed on the issue today.” … Though he’s clearly the best candidate by far in my view, it’s frightening to learn that he does know about animal agriculture and yet does not make the connection between it and global warming despite the fact that he states that global warming is the number one crisis facing us today. When I lived in Vermont I sent him and Senator Leahy letters and emails about the heinous living conditions of dairy cows on small farms there and never received a response. (Many of the cows were sick or misshapen; some had tumors; most had grotesque mastitis; many were lame–often an early symptom of mad cow disease; many suffered from diarrhea; the sleeping quarters of most were filthy; most were shut up in dark, dirty, crowded barns and not allowed to graze, etc.) How does he expect to win? Thank you for your comments and for sharing your experience with us. Yes, he knows. He has stated, ““I’m not a great fan of factory farming, I should tell you that.” Unfortunately, he has not made it an issue in his campaign and his votes don’t support this statement. But, the fact that he states he is “not a fan” provides ample evidence that he is familiar with the horrors of industrial animal agriculture. It also provides a rationale for reaching out to him at his events. I suspect he defends the dairy industry–and animal agriculture in general–because it is so prevalent in his state and he has needed his constituents votes for the past 25 years to get re-elected. He voted for the Farm Bill that provides subsidies to the dairy industry. Bernie’s wife sums it up best in her response to why he continues to subsidize animal agriculture in general. Um, yeah, he’s not perfect, and neither he or we present him as a “moral paragon”, just as someone who has been consistent in upholding the values he espouses and who has not taken money from big corporations, banks, lobbyists, etc. Yes, he falls short of a standard for animal rights that certainly no other viable candidate even comes close to. Certainly animal rights protesters have a right to demonstrate at his rallies; and to lobby; and to speak out loud and clear about how he falls short and what positions he should be taking. By all means, anyone who thinks the differences between Bernie Sanders and Hillary Clinton are unimportant for animals should consider that when she pushes through the TPP and aimilar “trade” deals it will guarantee that there will be no chance in hell (and hell is what it will be for animals and for us) for any reform of factory farms, only a worsening of the conditions, to avoid interfering with corporate profits. The deterioration of the environment and out of control global warming that will come about under her presidency with the TPP and her cozy relationship with fossil fuel companies, will that bring about conditions that are better for animals? And under her neocon, war-hawk administration, unending, increasing wars and testing to develop the weapons to sell for those wars will be good for animals, I suppose. I think there is a difference between accepting a perceived “lesser” of two evils (which is what the Trump-Clinton scaremongering scam is) and expecting from a politician a level of awareness and policy positions that only the tiniest fraction of the population can even conceive, much less support, saying that because he falls short of that, there are no substantive differences between him and a candidate who is actually worse on this issue (and frankly couldn’t be trusted even if she did take a better stance) and immeasurably worse on countless other issues that in fact directly or indirectly affect animals. Thank you for sharing your thoughts. You won’t get any arguments from me on your Clinton points, however, I don’t think the protesters are suggesting that people shouldn’t vote for Sanders. I view the protests as an attempt to encourage him to put animal rights on his agenda. A fair argument could be made that a rare candidate like Sanders should put all moral issues above votes rather than selectively deciding which moral issues are popular enough to appear in a platform. Oh Dear; we kind folks do have dreams of political honesty! Andrew; if only people could be true to their own self, above all! In my heart, I feel that Michele Obama would just love to speak out against all fast food business; and the eating of meat & dairy. She seems to truly care about the health of children and us USA people. Again, I think that she is unable to say what she thinks because; government is so controlled by big agriculture, etc. Yes, Michelle is very pro-vegetable. I appreciate that about her.